International Journal of Trend in Scientific Research and Development (IJTSRD) ISSN: 2456-6470 2456 approaches can be a good choice for obtaining high throughputs in a short span of time. Hence, video stream processing in the clouds is likely to become an active area of research to provide rovide high speed computation at scale, precision and efficiency for real world implementation of video analysis systems. However, so far major research focus has been on efficient video content retrieval using Hadoop , encoding/decoding , distribution tion of video streams  and on load balancing of computing resources for on-demand demand video streaming systems using cloud computing platforms , . Existing cloud based video analytics approaches do not support recorded video streams  and lack scalability , . GPU based approaches are still experimental . IVA 5.60  supports s only embedded video analytics and Intelligent Vision  is not scalable, otherwise their approaches are close to the approach presented in this research. The framework being reported in this paper uses GPU mounted servers in the cloud to capture and record video streams and to analyze the recorded video streams using a cascade of classifiers for object detection. A cascade of classifiers (termed as HaarCascade Classifier) is an object detection approach and uses real Adobos Algorithm to create c a strong classifier from a collection of weak classifiers. Building a cascade of classifiers is a time and resource consuming process. However, it increases detection performance and reduces the computation power needed during the object detection process. pr We used a cascade of classifiers for detecting faces/vehicles in video streams for the results reported in this paper. An “Analysis Request” comprises of the defined region of Interest,, an analysis criteria and the analysis time interval. The operator defines a region of interest in a video stream for an analysis.. The analysis criteria define parameters for detecting objects of interests (face, car, van or truck) and size/color based classification of the detected objects. The time interval represents the duration of analysis from the recorded video streams as the analysis of all the recorded video streams might not be required. A higher resolution video stream presents a clearer image of the scene and captures more details. However, it also requires more network bandwidth to transmit the video stream and occupies more disk storage. Other factors that may affect the video stream quality are video bit rate and frames per second. Video bit rate represents the number of bits transmitted from a video stream source sou to the destination over a set period of time and is a combination of the video stream itself and mate-data mate about the video stream. Frames per second (fps) represent the number of video frames stuffed in a video stream in one second and determines the smoothness moothness of a video stream. The video streams have been captured with a constant bit rate of 200kbps and at 25 fps in the results reported in this paper. selected video analysis ysis approach. The selection of a video analysis approach varies according to the intended video analysis purpose. The analytics results and meta-data about the video streams is stored in the Analytics Database. APS Client The APS Client is responsible for the enduser/operator interaction with the APS Server. The APS Client is deployed at the client sites such as police traffic control rooms or city council monitoring centers. It supports multi-user multi interaction and different users may initiate the analysis analy process for their specific requirements, such as object identification, object classification, or the region of interest analysis. These operator scan select the duration of recorded video streams for analysis and can specify the analysis parameters. The T analysis results are presented to the end-users end after an analysis is completed. The analyzed video streams along with the analysis results are accessible to the operator over 1/10Gbps 1/10 LAN connection from the cloud storage. The APS Client is deployed at the client sites such as police traffic control rooms or city council monitoring centers. Figure 2: Video Stream Analysis on a Compute Node EXPERIMENTAL SETUP This section tion explains the implementation and experimental details for evaluating the video analysis framework. The results focus on the accuracy, performance and scalability of the presented framework. The experiments are executed in two configurations; cloud deployment oyment and cloud deployment with Nvidia GPUs. International Journal of Trend in Scientific Research and Development (IJTSRD) ISSN: 2456-6470 2456 the video analysis approach on state of the art compute pute nodes with two GPUs each. These experiments also evaluate the video stream decoding and video stream data transfer between CPU and GPU during the video stream analysis. The energy implications of the framework at different stages of the video analyticss life cycle are also discussed towards the end of this section. EXPERIMENTAL RESULTS We present and discuss the results obtained from the two configurations detailed in Section V. These results focus on evaluating the framework for object detection accuracy, performance and scalability of the framework. The execution of the framework on the cloud nodes with GPUs evaluates the performance and detection accuracy of the video analysis approach for object detection and classification. It also evaluates the performance rformance of the framework for video stream decoding, video stream data transfer between CPU and GPU and the performance gains by porting the compute intensive parts of the algorithm to the GPUs. The cloud deployment without GPUs evaluates the scalability and robustness of the framework by analyzing different components of the framework such as video stream decoding, video data transfer from local storage to the cloud nodes, video data analysis on the cloud nodes, fault-tolerance fault and collecting the results after completion of the analysis. The object detection and classification results for vehicle/face detection and vehicle classification case studies are summarized towards the end of this section. Performance of the Trained Cascade Classifiers The performance mance of the trained cascade classifiers is evaluated for the two case studies presented in this paper i.e. vehicle and face detection from the recorded video streams. It is evaluated by the detection accuracy of the trained cascade classifiers and the timee taken to detect the objects of interest from the recorded video streams. The training part of the real AdaBoost algorithm is not executed on the cloud resources. The cascade classifiers for vehicle and face detection are trained once on a single compute node and are used for detecting objects from the recorded video streams on the cloud resources. depicted a decreasing trend with the increasing number of nodes in the cloud, as summarized in Figure 9. The analysis time of the recorded video streams decreased from 27.80 hours to 5.83 hours, when the number of nodes in the cloud varied from 33 15. The analysis time would further decrease when more nodes are added to the cloud. The larger volumes of video streams required more time to perform object detection and classification. The analysis time varied from 6.38 minutes to 5.83 hours, with the video stream data increasing from 5GB to 175GB. vehicle detection,” Transportation Research Part C– Emerging Technologies, vol. 3, no. 3, pp. 161– 161 174, June 1995. 10. 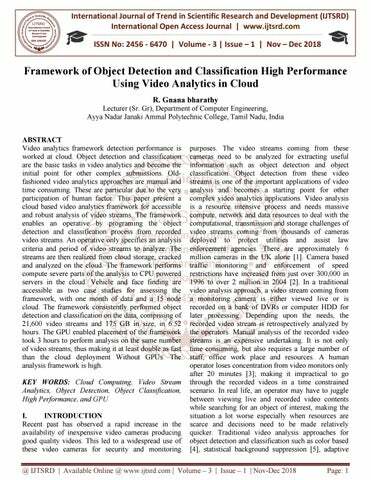 T. Abdullah, A. Anjum, M. Tariq, Y. Baltaci, and N. Antonopoulos,” ntonopoulos,” Traffic monitoring using video analytics in clouds,” in 7th IEEE/ACM International Conference on Utility and Cloud Computing (UCC), 2014,pp. 39–48. 39 11. K. F. Mac Dorman, H. Nobuta, S. Koizumi, and H. Ishiguro, “Memory based attention control for activity recognition at a subway station,” IEEE Multimedia,, vol. 14, no. 2, pp. 38–49, 38 April 2007. 12. C. Stauffer and W. E. L. Grim son, “Learning patterns of activity using real-time tracking,” IEEE Transactions on Pattern Analysis and Machine Intelligence, vol. 22, no. 8, pp. 747–757, 747 August 2000. 13. C. Stauffer and W. Grim son, “Adaptive background mixture models for real-time tracking,” in IEEE Computer Society Conference on Computer Vision and Pattern Recognition, 1999, pp. 246–252. 14. P. Viola and M. Jones, “Rapid “R object detection using a boosted cascade of simple features,” in IEEE Conference on Computer Vision and Pattern Recognition, 2001, pp. 511–518. 511 15. Y. Lin, F. Lv, S. Zhu, M. Yang, T. Cour, K. Yu, L. Cao, and T. Huang,“ Large-scale image classification: n: Fast feature extraction and svm training,” in IEEE Conference on Computer Vision and Pattern Recognition(CVPR), 2011. 16. V. Nikam and B. B. Meshram, “Parallel and scalable rules based classifier using map-reduce paradigm on hadoop cloud,” International Journal Jou of Advanced Technology in Engineering and Science, vol. 02, no. 08, pp.558–568, pp.558 2014. 17. R. E. Schapire and Y. Singer, “Improved boosting algorithms using confidence-rated confidence predictions,” Machine Learning, vol. 37, no. 3, pp. 297– 297 336, December 1999. 18. K. Shvachko, vachko, H. Kuang, S. Radia, and R. Chansler, “The hadoop distributed file system,” in 26th IEEE Symposium on Mass Storage Systems and Technologies (MSST), 2010. 19. A. Ishii and T. Suzumura, “Elastic stream computing with clouds,” in4th IEEE Intl. Conference on n Cloud Computing, 2011, pp. 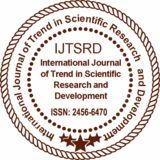 195– 195 202.
International Journal of Trend in Scientific Research and Development (IJTSRD) ISSN: 2456-6470 2456 20. Y. Wu, C. Wu, B. Li, X. Qiu, and F. Lau, “Cloud Media: When cloud on demand meets video on demand,” in 31st International Conference on Distributed Computing Systems, 2011, pp. 268 268– 277. 30. T. Wigand,, G. J. Sullivan, G. Bjontegaard, and A. Luthra, “Overview of the H.264/AVC video coding standard,” IEEE Trans. on Circuits and Systems for Video Technology, vol. 13, no. 7, pp. 560–576, July 2003. 21. J. Feng, P. Wen, J. Liu, and H. Li, “Elastic Stream Cloud (ESC): A stream-oriented oriented cloud computing platform for rich internet application,” in Intl. Conf. on High Performance Computing and Simulation, 2010. 31. H. Schulzrinne, A. Rao, and R. Lanphier, “Real time streaming protocol (RTSP),” ( Internet RFC 2326, April 1996. 32. H. Schulzrinne, zrinne, S. Casner, R. Frederick, and V. Jacobson, “RTP: A transport protocol for realtime applications,” Internet RFC 3550, 2203. 34. “Open Stack icehouse,” icehouse http://www.openstack.org/software/icehouse/. 25. B. S. System, “IVA 5.60 intelligent video analysis,” Bosh Security System, Tech. Rep., 2014. 35. J. Nickolls, I. Buck, M. Garland, and K. Skadron, “Scalable parallel programming with CUDA,” Queue-GPU GPU Computing, vol. 16, no. 2, pp.40–53, pp.40 April 2008. 26. “EPTA Cloud,” http://www.eptascape.com/products/eptaCloud.ht ml 27. “Intelligent vision,” http://www.intelli http://www.intellivision.com/products/intelligentvideo vision.com/products/intelligentvideo-analytics. 28. K.-Y. Y. Liu, T. Zhang, and L. Wang, “A new parallel video understanding and retrieval system,” in IEEE International Conference on Multimedia and Expo (ICME), July 2010, pp. 679–684. 29. J. Dean and S. Ghemawat, ““Map reduce: Simplified data processing on large clusters,” Communications of the ACM, vol. 51, no. 1, pp. 107–113, January 2008. 36. J. Sanders and E. Kandrot, CUDA by Example: An Introduction to General-Purpose General GPU Programming, 1st ed. Addison-Wesley Addison Professional, 2010. 37. http://cogcomp.cs.illinois.edu/Data/Car/. 38. http://www.itl.nist.gov/iad/humanid/feret/. 39. http://www.nvidia.com/object/gcr-energyhttp://www.nvidia.com/object/gcr efficiency.html. 40. M. Zaharia, M. Chowdhury, M. J. Franklin, S. Schenker, and I. Stoica, “Spark: Cluster computing with working sets,” in 2nd USENIX conference on Hot topics in cloud computing, 2010.